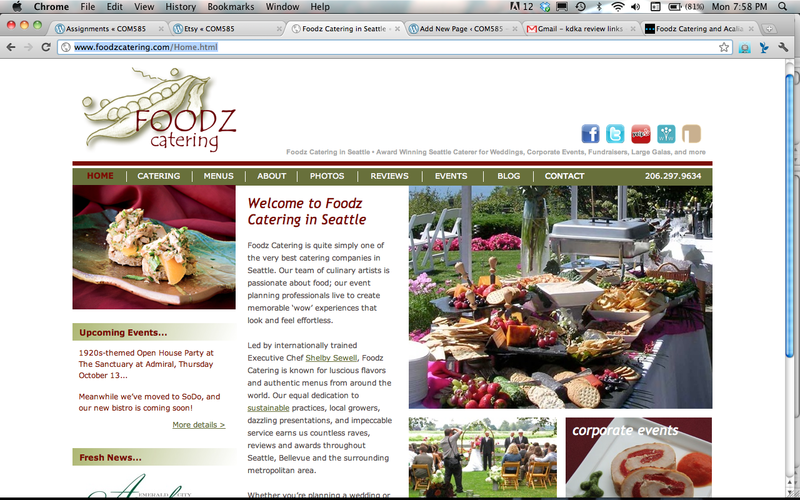 Provides catering for weddings, birthdays, anniversaries, corporate events and other special occasions. Mission: Foodz Catering exists to create beautiful, enjoyable experiences that tantalize the senses of taste, smell, touch and sight, and later reward the mind and heart with lifelong memories. Elegant design with one main navigation directing users to services, menus and samples of previous events they have catered. Nice, tasteful imagery throughout the site. Adults of all ages looking for professionals adept at handling corporate events. To generate revenue, build clientele and provide relevant information for existing clients. To use nothing but the finest ingredients to craft exquisitely delectable food — artful and pleasing to the eye, while thoroughly delightful to the palate. We wish to provide personal service perfectly tailored to customers’ taste, style, vision and desired experience by developing an intuitive relationship with our clients. Homepage links directly to Facebook, Twitter and reviews on Yelp and Wedding Wire. WordPress powered site with WordPress blog.